Chicken Wings go so well with red fermented beancurd. You'll be amazed. Mind you, this Chicken Wings with Red-Fermented Beancurd dish is so addictively delicious. 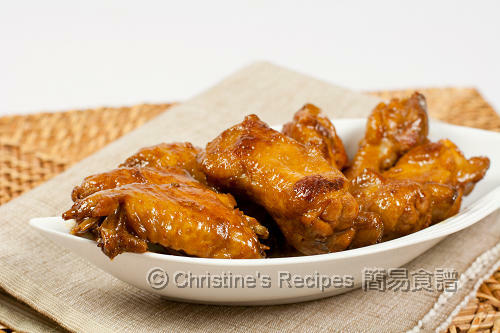 Chicken wings are one of most popular snacks and dishes for my friends living in Hong Kong. Why? Not quite sure. It might be easier to get and cook than a whole chicken. If we put up any bring-a-plate social gathering, it’s safe to have an organizer and make sure not every family brings a plate of chicken wings, seriously. Once I joined a gathering for families, by surprise, I found there were seven different dishes of chicken wings served on a long table. We all made fun of ourselves for having a big feast of chicken wings. We did enjoy though. So, you might get the idea of how popular chicken wings are in our culture. These chicken wings were cooked with a very unique Chinese condiment, red fermented beancurd. Initially, I had a bit of hesitation, joggling for a while before adding the condiment. I guessed it might not appeal to my daughter’s western palate. Yet, it took me by surprise, she loved them and ate more than half of the dish. It might be the charming of chicken wings do the trick anyway. Maybe the red fermented beancurd does the trick. Who knows? Or both. Heat oil over medium heat. Add ginger and red fermented beancurd paste, saute to fragrant. Add chicken wings. Stir to combine and cook until both sides are light brown. Pour in wine and quickly stir to combine. Add seasoning. When it boils, reduce heat to medium-low and simmer until sauce thickens. Stir in honey. Remember to taste by yourself. Add more honey if needed. Serve hot. If you use frozen chicken wings, blanch in boiling to remove any frozen smell after defrosting. No wonder your girl liked them. They look so yummy, I'm salivating here too, .... oh lunch time! Oh..this sounds like 虾酱鸡！Love it! I've tried a similar recipe with feremented beancurd, it's really good! Yours look really yummy! 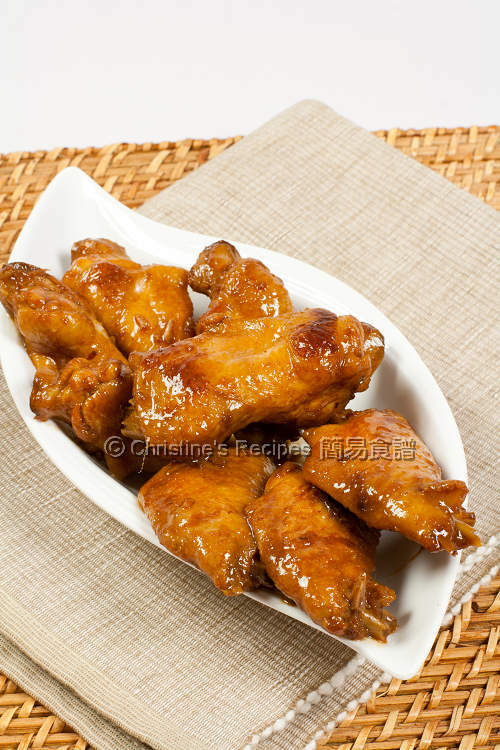 I don't have red fermented beancurd in my pantry - so I can only drool at your chicken wings! How funny? Your potluck shd be a chicken wings potluck and you can enjoy all the different varieties of wings! 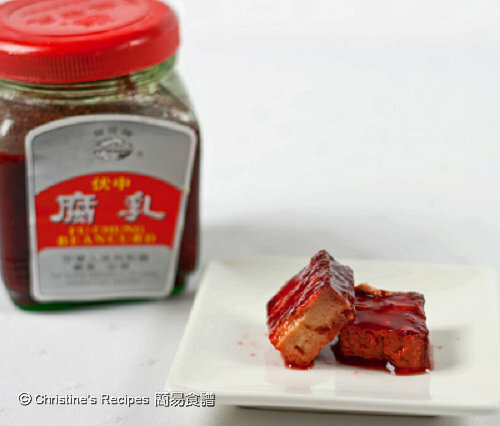 Love red fermented beancurd in chicken wings, I've only tried making a deep-fried version, can't wait to try out yours! So yummy looking! I truly believe that chicken wings are the most tasty part of the chicken! I always go for them if there is a choice... and your version with that glossy sauce looks delicious! This looks so inviting. I remember my Dad keeping the red fermented beancurd in a clay jar. And when he cooked with it, the delicious smell filled the whole house. I'll try your delicious recipe straightaway! Cheers! Oooohhh....golden and looks very delicious. I can eat a whole plate and that would be my lunch :D I love that red fermented bean curd...really nice with congee. I've posted an egg tart recipe and have linked it to yours as I followed your baking instructions ..... thanks for sharing! ooh, i just love these special condiments you use in chinese cookery - i can understand why your daughter enjoyed these. Do we have to marinate the chicken wings first before cooking? For this recipe, you don't need to. The chicken wings would absorb flavours in the process of cooking. When do you add in the Shaoxing wine? It doesn't specify in the instructions (or at least, not to me). Stated in "Method" step 2, "Pour in wine and quickly stir to combine." I have made this a few times.I always come back to this! So yummy! Good to know that you love this dish. This is so addictive, haha.